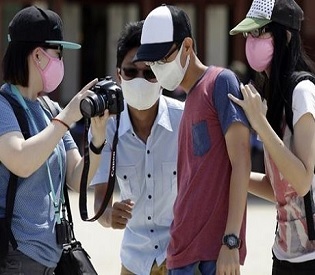 June 05, – South Korea reported on Friday a fourth death from Middle East Respiratory Syndrome (MERS), as an infected doctor fuelled fears of a fresh surge in cases and prompted Seoul’s mayor to declare “war” on the virus. The latest fatality was a 76-year-old male patient who died Thursday after testing positive for the virus on May 21. Criticised for its lack of transparency in addressing the health scare, the Health Ministry finally confirmed the name of the hospital where the first patient to be diagnosed with MERS was treated. The ministry said anyone who had visited the hospital in Pyeongtaek, about 65 kilometres (40 miles) south of Seoul, between May 15-29 should report to a clinic for screening. The government had initially declined to name any hospitals treating MERS cases, arguing that it could cause them unfair commercial losses. “From now on, Seoul city is embarking on a war against MERS. We will take swift and stern measures … to protect the lives and safety of our citizens,” Park told reporters Friday. Health Minister Moon Hyong-Pyo apologised for the public anxiety caused by the outbreak, but rejected Park’s criticisms, saying the mayor was encouraging “mistrust and misunderstanding”. The government had been handling the doctor’s case carefully to avoid public panic, Moon added. More than 1,000 schools, from kindergartens to colleges, have temporarily shut down across the country, while the government’s MERS hotline has been taking thousands of calls a day. MERS has now infected 1,161 people globally, with 436 deaths. More than 20 countries have been affected, with most cases in Saudi Arabia. The World Health Organization has said it expects more infections in South Korea, while stressing there was currently “no evidence of sustained transmission in the community”. A health ministry statement said a WHO team would visit next week, citing concerns that the virus has been showing a “slightly different” pattern from the one detected in Middle East. “We have yet to determine whether there has been any mutation,” said Choi Bo-Yul, the head of a civilian task force set up to help with the outbreak. Among the recent infections was an Korean Air Force chief master sergeant, who represented the first MERS case among members of the military. The airman is serving at the air base in Osan, south of Seoul, which also hosts the US 51st Fighter Wing. In a message to base personnel, the fighter unit’s chief medical officer, Colonel Krystal Murphy, said around 100 people who had been in contact with the infected man had been asked to remain at home.